Those who begin to study mathematics usually find it difficult to develop the habit of strictly formulating the ideas to be expressed, to learn the methods of correct reasoning, and to comprehend the basic concepts of mathematics. These difficulties seem to be caused, first, by the lack of adequate training in mathematical logic, that is the discipline whose tasks is to study deductive reasoning employed in proving mathematical theorems; second, by the ignorance of the basic concepts and methods used in set theory, now commonly applied in all branches of mathematics and serving as the basis for introducing and explaining fundamental mathematical concepts (relations, mappings, etc. ); third, by the ignorance of the basic concepts of abstract algebra, a discipline which has been developing vigorously and is now affecting all the remaining branches of mathematics. The present book covers those elements of mathematical logic, set theory, and abstract algebra which will enable the reader to study modern mathematics, which explains the title. 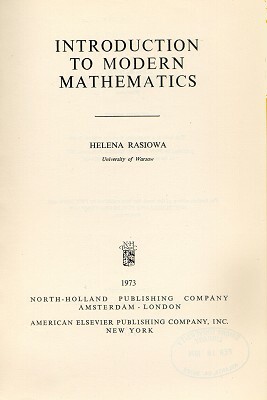 The book has developed from my lectures on Introduction to mathematics, which I have given in Warsaw University for a couple of years, and is intended mainly as a freshmen course in mathematics. Its scope goes much beyond the Introduction to mathematics as formulated in the curriculum, and this is why it may prove useful to other readers as well—those studying engineering, natural science, and the humanities—who want to prepare for advanced mathematical studies or to become familiar with elements of mathematical logic, set theory, and the basic concepts of abstract algebra. The present author's intention was to make the book form a complete whole and to encourage at least some readers to a further study of those branches of mathematics.